Pope Francis walks past flowers as he celebrates the Easter Mass, in St. Peter's Square, at the Vatican, April 16, 2017. 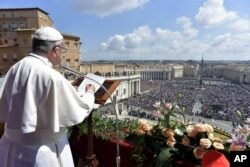 Throngs of the faithful endured heavy security checks to secure a place in the Vatican's flower-filled Saint Peter's Square for Pope Francis' celebration of Easter Mass and his delivery of his annual "Urbi et Orbi" - "to the city and to the world" - Easter address. Pope Francis denounced how migrants, the poor and the marginalized are treated. He said they see their "human dignity crucified" every day through injustice and corruption. Pope Francis delivers his Urbi et Orbi (to the city and to the world) message from the main balcony of St. Peter's Basilica, at the Vatican, April 16, 2017. In Florida, U.S. President Donald Trump attended an Easter church service in Palm Beach, accompanied by first lady Melania Trump, daughter Tiffany and son Barron. Melania Trump’s parents also were there. The Episcopal Church of Bethesda-by-the-Sea was the site of the president and first lady’s wedding in 2005. This year, however, the date of the Roman Catholic and Protestant observance of Easter coincides with the Orthodox churches. The two Easters are usually weeks apart, with the Western Christian church following the Gregorian calendar, while the Eastern Orthodox uses the older Julian calendar. 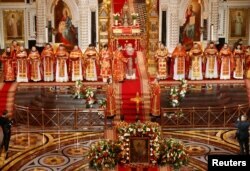 Patriarch Kirill, the head of the Russian Orthodox Church, conducts the Orthodox Easter service at the Christ the Saviour Cathedral in Moscow, Russia, April 16, 2017. In Jerusalem, a sunrise service at the Garden Tomb, where worshippers sang hymns of the resurrection, set the biblical tone. Throughout the day, masses of different denominations of both Western and Eastern Christians coexisted in the same holy space. 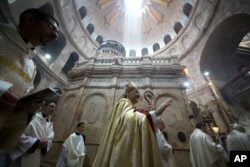 Wajeeh Nusseibeh, a Muslim man and member of one of the two families that guard and keep the Church of the Holy Sepulcher in Jerusalem, said there were fewer people visiting the holy place this year than in the past. The Old City also had Jewish pilgrims celebrating the weeklong biblical holiday of Passover— the story from the biblical Exodus celebrating the ancient Israelites' liberation from Egyptian slavery. Reports say many of the attendees were ultra-Orthodox Jews in dark suits and hats, but they were joined by others, including members of the Israel’s Ethiopian Jewish community. 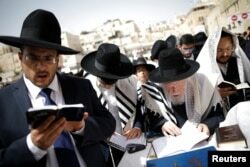 Ultra-Orthodox Jewish worshippers take part in the priestly blessing prayer on the holiday of Passover at the Western Wall in Jerusalem's Old City, April 13, 2017. Armed Israeli police and soldiers patrolled the streets near the site of Christ’s tomb, but the atmosphere was calm. In Egypt, however, authorities beefed up security after a suicide bomb attack on a Coptic Christian church last Sunday left dozens dead and more than 100 wounded. Easter marks the end of Holy Week, which includes Maundy Thursday, the day of Jesus' last supper with his disciples. Holy Week also includes Good Friday, the day Jesus was crucified. In predominantly Orthodox countries such as Russia and Serbia, government and church leaders attended midnight masses and held liturgy. Ecumenical Patriarch Bartholomew I, the spiritual leader of the world's Orthodox Christian faithful, conveyed a message of peace during midnight mass at the Patriarchate in Istanbul, Turkey. “Our faith is alive,” he said. Ecumenical Patriarch Bartholomew I, center, the spiritual leader of the world's Orthodox Christians, leads the Easter Resurrection Service outside the Patriarchal Cathedral of St. George in Istanbul, early Sunday, April 16, 2017. "This message - of the victory of life over death, of the triumph of the joyful light of the (Easter) candle over the darkness of disorder and dissolution - is announced to the whole world from the Ecumenical Patriarchate with the invitation to experience the unwaning light of the resurrection,'' he said. Patriarch Irinej, the head of the Serbian Orthodox Church, delivered a gloomier Easter message. “With great sadness and pain in our hearts, we must note that today’s world is not following the path of resurrection but the road of death and hopelessness,” he said.